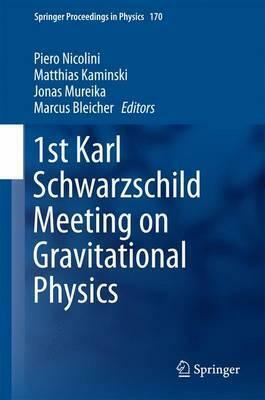 These proceedings collect the selected contributions of participants of the First Karl Schwarzschild Meeting on Gravitational Physics, held in Frankfurt, Germany to celebrate the 140th anniversary of Schwarzschild's birth. They are grouped into 4 main themes: I. The Life and Work of Karl Schwarzschild; II. Black Holes in Classical General Relativity, Numerical Relativity, Astrophysics, Cosmology, and Alternative Theories of Gravity; III. Black Holes in Quantum Gravity and String Theory; IV. Other Topics in Contemporary Gravitation. Inspired by the foundational principle ``By acknowledging the past, we open a route to the future", the week-long meeting, envisioned as a forum for exchange between scientists from all locations and levels of education, drew participants from 15 countries across 4 continents. In addition to plenary talks from leading researchers, a special focus on young talent was provided, a feature underlined by the Springer Prize for the best student and junior presentations. Illustrations note XXI, 407 p.
Inspired by the foundational principle ``By acknowledging the past, we open a route to the future," the week-long meeting, envisioned as a forum for exchange between scientists from all locations and levels of education, drew participants from 15 countries across 4 continents. In addition to plenary talks from leading researchers, a special focus on young talent was provided, a feature underlined by the Springer Prize for the best student and junior presentations. (B. J. Carr).- Scattering and unitarity methods in two dimensions (Valentina Forini, Lorenzo Bianchi and Ben Hoare).- Gravity Duals to Non-Relativistic Quantum Field Theories (Andreas Karch and Stefan Janiszewski).- A `regularized' Schwarzschild solution (F.R. Klinkhamer).- The Chemistry of Black Holes (Robert B. Mann).- Black Holes in Supergravity (K. S. Stelle).- Thermodynamic of Distorted Reissner-Nordstroem Black Holes in Five-dimensions (Shohreh Abdolrahimi).- What is the Schwarzschild radius of a quantum mechanical particle? (Roberto Casadio).- The Background Effective Average Action Approach to Quantum Gravity (Giulio D'Odorico, Alessandro Codello, and Carlo Pagani).- Phase transitions of regular Schwarzschild-Anti-de Sitter black holes (Antonia Micol Frassino).- Vector Fields and Kerr/CFT Correspondence (A. M. Ghezelbash).- Black Holes in Non-relativistic Holography (Stefan Janiszewski).- Black holes and running couplings: A comparison of two complementary approaches (Benjamin Koch, Carlos Contreras, Paola Rioseco, and Frank Saueressig).- Quantum Harmonic Black Holes (Alessio Orlandi, Roberto Casadio).- Holographic entanglement entropy of semi-local quantum liquids (Da-Wei Pang, Johanna Erdmenger, and Hansjoerg Zeller).- Quadratic Palatini gravity and stable black hole remnants (D. Rubiera-Garcia, Francisco S. N. Lobo, and Gonzalo J. Olmo).- Kermions (Elizabeth Winstanley).- Part IV Other Topics in Contemporary Gravitation.- Quantum Gravity and the Cosmological Constant Problem (J. W. Moffat).- Emergent gravity and the cosmological constant (T. Padmanabhan).- Tunnelling methods and Unruh-DeWitt detectors in curved spacetimes (Giovanni Acquaviva).- Fermions on adS (Victor E. Ambrus, and Elizabeth Winstanley).- Study on Rescaling Extrinsic Curvature in Gravitational Initial Data (Shan Bai and Niall 'O Murchadha).- Massive gravities (Dennis D. Dietrich).- Self Sustained Traversable Wormholes and Topology Change Induced by Gravity's Rainbow (Remo Garattini).- A general maximum entropy principle for self-gravitating perfect fluid (Sijie Gao).- Dynamical holographic QCD model: resembling renormalization group from ultraviolet to infrared (Mei Huang and Danning Li).- Modified Theories of Gravity with Nonminimal Coupling and the Faint Young Sun Paradox (Lorenzo Iorio).- A Practical Look at Regge Calculus (Dimitri Marinelli and Giorgio Immirzi).- Boundary States of the Potts Model on Random Planar Maps (Benjamin Niedner, Max Atkin and John Wheater).- One-loop Effective Action in Quantum Gravitation (L. Rachwal, A. Codello, and R. Percacci).- Heavy Probes in Strongly Coupled Plasmas With Chemical Potential (Andreas Samberg and Carlo Ewerz).